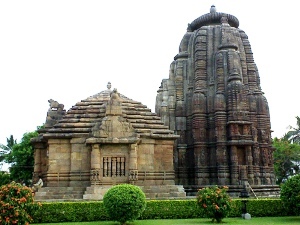 Raja Rani Temple is an another marvel to the temple city of India. This temple is dedicated to Lord Brahma. The temple is called as Rajarani due to the use of particular type of sand stone in the construction of the structure bearing the name as Rajarani. The Rajarani temple is also famous for the tall and slender nayikas (temple figures) carved in high relief on the walls-figures in amorous dalliance and in such acts as fondling her child, looking into the mirror, taking off her anklet, caressing the bird, playing instrument, holding branches of trees etc. The Rajarani takes its name from the local sandstone used to built it. The temple no longer has an image of the deity in the sanctuary but its strong Saiva associations are testified from the figures of Shiva and his consort Parvati on the platform and Saiva doorkeepers.